Lab Frames are convenient for distillation and general setups. 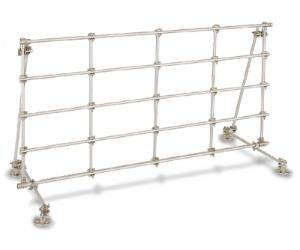 Can be assembled as 1220Lx610Hmm (48x24") horizontal or 610Lx1220Hmm (24x48") vertical frame. Base is 46 cm (18") wide for stability. Ordering information: Each Lab Frame includes eight 51 mm (2") rods, two 457 mm (18") rods, seven 610 mm (24") rods, four 1220 mm (48") rods, four rod end connectors, thirty-five S-connectors, and four Lab Frame feet.